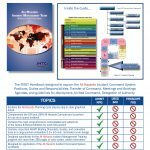 IMTC, LLC., is proud to announce it has produced the FIRST Field Response and Planning Guide (RPG Information) designed specifically for the All-Hazards Incident Management Team Training Program and the All-Hazards ICS courses. In its 260+ pages of full color graphs and diagrams, The All-Hazards Incident Management Team Response and Planning Guide (AHIMT RPG) accurately details the All-Hazards Planning Cycle in step-by-step detail. The All-Hazards Planning cycle is taught within the EMI position-specific training courses, the USFA’s AHIMT Course, and the NIMS Planning Process Video, but has not been detailed in a field guide until now. 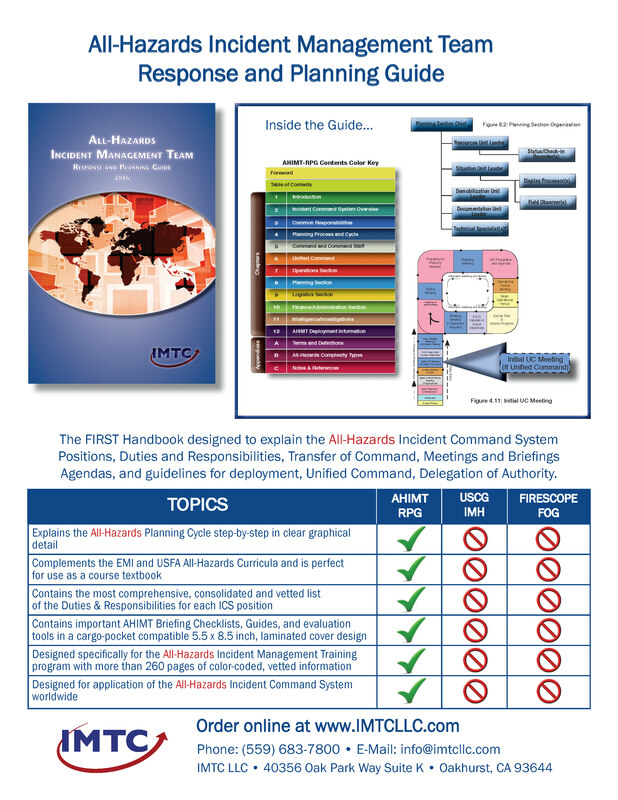 The Guide also contains the most comprehensive, consolidated and vetted list of the Duties & Responsibilities for each ICS position, includes important AHIMT Briefing Checklists, Guides, and evaluation tools all in a cargo-pocket compatible 5.5 x 8.5 inch, laminated cover design. It complements the EMI and USFA All-Hazards Curricula and is perfect for use as a course textbook during the course and a field guide during responses. Call our office (559) 683-7800 for details!